Update your look with a contemporary update on a classic style with these stunning Creole earrings, crafted from 9ct yellow gold and featuring a modern, double hoop design. A textured hoop twists next to a smooth and sleek hoop for a chic and sophisticated style statement. 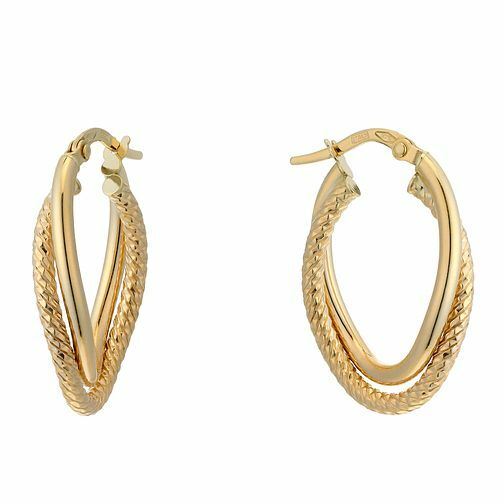 9ct Yellow Gold Double Twist Hoop Creole Earrings is rated 5.0 out of 5 by 2. Rated 5 out of 5 by Anonymous from Excellent Value The earrings are lovely, bought them for a Christmas present for my daughter. Really delicate and pretty. Rated 5 out of 5 by Anonymous from very elegant Just a perfect set of earrings for ever day wear. They look very elegant and are comfortable to wear.